yet another not-exactly-thrilling sewing project. i was not into sewing before ramona was born. if i had been, i probably would have gone nuts sewing her little outfits & making all her cloth diapers myself. but instead, we bought all that. my friend amanda gifted us a big waterproof drawstring laundry bag. it came in handy because diaper laundry can really smell (shocker), & cinching the drawstring tight contains the reek. i had been thinking for a while that a bag with a zipper would be a lot more sensible. it would be easier to use & it would contain the smell better. i added it to my ever-growing list of sewing projects, but you know. there’s a lot of stuff on that list. 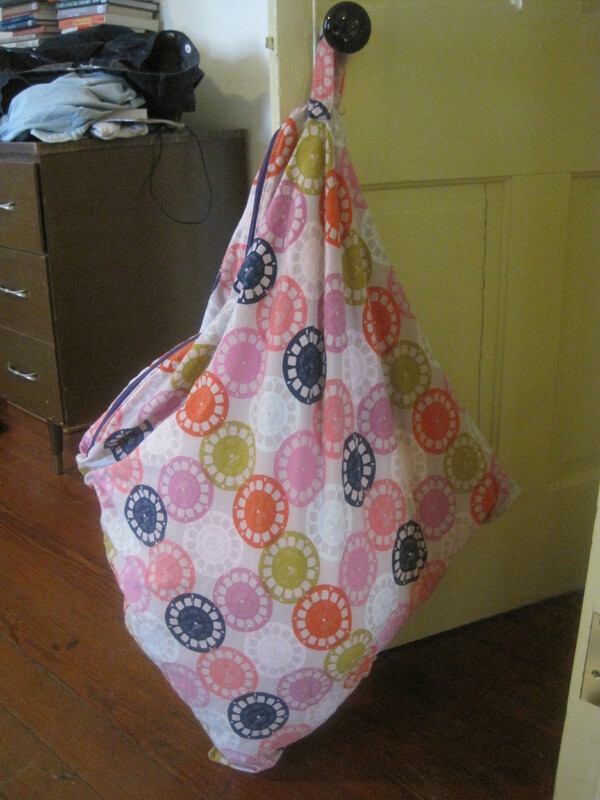 making a zippered laundry bag wasn’t exactly rocketing to the top of the list of things i was super-stoked to sew. but when the bag we had self-destructed, i had to act fast. a toddler doesn’t hold its poop just because there’s nowhere to put it. i cut a length of viewfinder print fabric (in the pink colorway, which, upon reflection, is my least favorite of the three colorways, & therefore ideal for containing gross laundry) to the same size as the existing laundry bag, sandwiched a zipper between the fabric & the waterproof bag opening (because only the drawstring surrendered–the body of the bag is fine, & this way we still have leakage/smell containment), & sewed. then i sewed up the seams on the fabric, topstitched around the zipper, & done. really, the hardest/most time-consuming part was pressing the fabric & figuring out the proper dimensions for cutting it. as soon as i was done, i took my temperature & it was 102 degrees. so that was the start of the pneumonia, & i think the explanation for why i was having such a hard time figuring out what size to cut a damn rectangle of fabric. this would have been a much faster, easier project had i been fully healthy & in command of my faculties. oh, i also made a little loop from webbing covered in fabric, which i stitched to the outside of the bag. this is to loop the bag over the door handle. i don’t know why we do that. i guess just to keep the laundry bag in one place? i did break a needle sewing a box to secure the loop. which is crazy because i’ve sewn webbing twice that thick with no problems. maybe i was using a heavier needle? i did this one with just a universal needle. we’ve been using the new bag for a couple of weeks now & i love it. it’s nicer to look at than the plain baby blue bag we had before, the zipper is way faster & easier to use than the drawstring, & it’s just pleasing to look around the house & see so many things i’ve made myself. it was also nice to whip up a quick project without having to buy any new supplies. the webbing was left over from a bag i made, the zipper was originally for a dress that wound up with an invisible zipper instead, & the fabric was just a length i had purchased with no specific purpose in mind. in other news, has anyone reading this ever read any of the “scraptherapy” books? i think there are two. i read one the other day. the idea is that you cut up all your little scraps (quilting cotton, specifically, which is something i have a lot of) into three different sizes so they are all trimmed & ready to roll for scrap projects. i’m thinking about trying it, but i’m nervous because i do a lot more with fabric than just quilting. i use scraps for muslins, piping, pocket linings, bindings, bias tape, paper-piecing projects, fussy cutting…i’m worried that cutting it all into a few pre-determined sizes will foreclose on some of what i do with my scraps, but i can’t deny that the idea of neatly trimmed & organized squares appeals to me much more than the crumpled mess of bits & bobs currently residing in my quilting cottons bin. i’m trying to figure out the smartest way to proceed. i’m thinking about going ahead & fussy cutting the fabric i specifically bought for fussy cutting, cutting the rest into a few pre-determined sizes, & making piping & bias tape from the little bits left over. & of course, leaving bigger pieces for muslins & pockets. of course, it’s nice to fantasize about being so organized. who knows if it will ever come to pass. i’m exhausted right now because i think ramona is getting her two-year molars. she’s been chewing on her crib railing (i should probably make a cover for it) to the point that it honestly looks like it’s been attacked by beavers. last night she kept me up for FOUR HOURS singing & reciting her books. she seemed cheerful enough, but she just wouldn’t go to sleep. we were up from 1:30am until 5:30am. i wanted to cry. & also sleep. I broke a ton of needles on the webbing for the bag I made. I guess maybe webbing just really likes to eat needles? It’s probably some combo of it being super thick and super rigid. The bag looks awesome! I don’t have a ton of projects around the house where I can look at it and get all happy that I made it, but it’s getting up there. I definitely smile every time I walk by the curtains that I’ve made. i used cotton webbing, which is a looser knit so i think it’s a little easier for the needles to sink into it, compared to nylon webbing. also, when i didn’t break any needles sewing it, i was using a denim needle. & i was super-nervous about breaking a needle so i was going really slowly. this time i was using a lighter universal needle & sewing more quickly because i hadn’t had problems before. whoops!